Pisa, thanks to its inclined tower is one of the most famous places in the world, but it is also the city of discoveries, the famous University, a city that holds treasures of inestimable value that make it among the most important Italian cities of art, because it offers visitors the unique scenery of Piazza dei Miracoli (UNESCO World Heritage Site since 1987) and is also the gateway to Tuscany. Thanks to the international airport "Galileo Galilei" and the excellent rail links, Pisa is the ideal base for exploring the region and the nearby cities of Florence, Siena, Lucca, Livorno, Pistoia. When a foreigner thinks of Italy, often the Tower of Pisa is among the first things that come to mind, a unique symbol, but Pisa is not only this: it has a beautiful old town with narrow streets and wide squares, Renaissance buildings, medieval tower houses, churches in Romanesque and Gothic style, the beautiful Lungarno, and offers unique views where to go shopping (as under the ancient loggias of Borgo Stretto) or buy fresh fruits and vegetables (the characteristic Piazza delle Vettovaglie). Anyone who wants to walk through its streets and browse the stately buildings transformed into university buildings, would find a reference to the history of scientific research that since 1343, the years of foundation of his university, has marked the life of the city. The birth certificate of the University of Pisa is the Bull "In Sipremae dignitatis" by Pope Clement VI, almost seven centuries have passed since then. 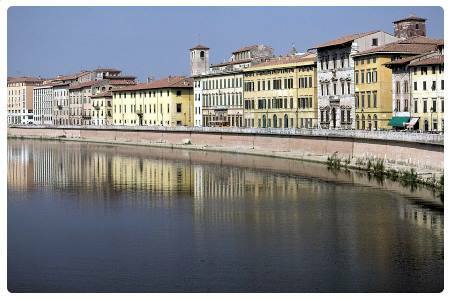 Pisa has a population of about 100,000 inhabitants and 35,000 are the students, so the cultural life is lively, there are many events, festivals and events held here every year and there is a wide choice of clubs, restaurants and discos. 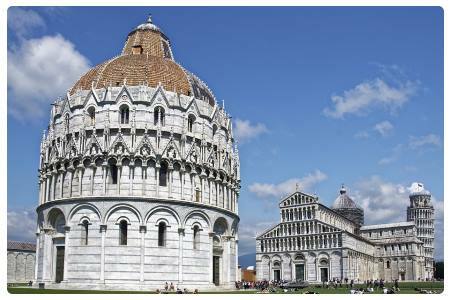 Pisa is the capital of the homonymous Tuscan province, like Florence, is crossed by the river Arno. It was one of the four ancient Maritime Republics, has become a thriving city with its monuments known throughout the world as the Leaning Tower, the Cathedral and the Baptistery in Piazza dei Miracoli. These buildings are really miracles of architecture and testify to the power and wealth of the city in the Middle Ages, when Pisa had trade relations with the Arab world and the Mediterranean countries. There are many interesting museums in Pisa: along the Arno there are the Museum of San Matteo, the Museum of Contemporary Graphics, the Blue Palace and the last great work by Keith Haring, the mural "Tuttomondo" (1989). The Leaning Tower belongs to a set of four imposing buildings located at the "Field of Miracles" (Piazza dei Miracoli), UNESCO World Heritage Site: the Cathedral of Santa Maria Assunta of the XI-XII century, the Bell Tower (the Leaning Tower that was actually a bell tower) of 1173, the Baptistery, with its 18 meters in diameter, the twelfth-fourteenth century and the cemetery (Cemetery). The Duomo is the greatest example of Pisan Romanesque architecture. A monumental work, which houses priceless works by artists such as Ghirlandaio, Beccafumi, Andrea Del Sarto, Cimabue, Giovanni Pisano, Giambologna. 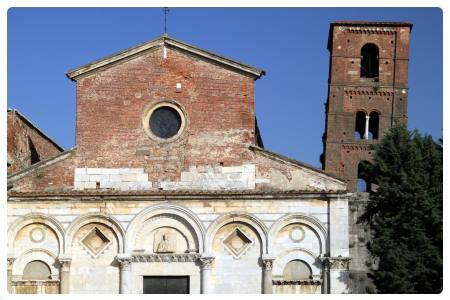 There are also other notable buildings such as the churches of San Frediano (11th-12th centuries), Santa Caterina (13th-14th centuries), Santo Stefano dei Cavalieri (1569) and the Palazzi dell'Orologio e dei Cavalieri. 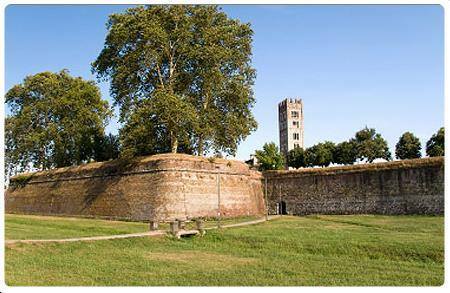 During your visit to the city you will cross Piazza dei Cavalieri, the second most important square in Pisa after Piazza del Miracoli, so called because it was the seat of the ancient military order of the Sacred Order of Santo Stefano, a chivalric order of papal foundation. In the square overlook the most important palaces and churches of the Grand Duchy of Pisa, first of all the Palace of the Knights with its majestic facade, home to the prestigious Scuola Normale Superiore di Pisa; the Palazzo dell'Orologio where he was starved to death, along with two children and two grandchildren, Count Ugolino della Gherardesca, accused of treason to his city, to whom Dante dedicated 90 verses of the XXXIII canto of the Inferno, condemning him for eternity to anthropophagy, that is to cannibalism, eating for the eternity of the head of his enemy, Bishop Ruggeri. Continuing along Via Santa Maria towards the banks of the river Arno, you will find the beautiful Gothic Church of Santa Maria della Spina. Considered a masterpiece of Gothic art in Italy. The name derives from a thorn from the crown of Christ, which a local merchant brought to Pisa on his return from the Holy Land. The church, which is now located on the Lungarno Gambacorti, was at the time of its construction, in 1230, on the right bank of the Arno. In the nineteenth century it was dismantled and moved to prevent it from being damaged by frequent flooding of the river, a fate that in the next century instead touched many other ancient buildings. Five bridges cross the Arno and many artists have written about the charm of the Lungarni, including Byron, Shelley, Montesquieu, Leopardi, Carducci, D'Annunzio and Foscolo. The Lungarni are particularly romantic at night, thanks to the lights of the wrought iron lamps and the buildings that extend their shadows in the waters of the river. Along the Arno River is also the Museo Nazionale di San Matteo (National Museum of St. Matthew), which collects works from churches and convents in the city and the area and is housed in the former Benedictine convent of St. Matthew of the thirteenth century. In the museum, which is really worth a visit, there are works by important artists such as Giunta Pisano, Simone Martini, Lippo Memmi, Francesco Traini, as well as paintings by Masaccio, Beato Angelico, Benozzo di Lese and Ghirlandaio and masterpieces by Nicola Pisano and Donatello. The Museum also houses a precious collection of illuminated manuscripts, medieval ceramics and wooden sculptures. Una delle poesie più romantiche di tutti i tempi, "A Silvia" di Giacomo Leopardi fu scritta durante il soggiorno a Pisa del grande poeta di Recanati. Magari la prossima volta che vi capiterà di passeggiare sui Lungarni vi verranno in mente alcune delle sue strofe. One of the most romantic poems of all time, "A Silvia" by Giacomo Leopardi was written during the stay in Pisa of the great poet of Recanati. Perhaps the next time you happen to walk along the Lungarni will come to mind some of his verses. 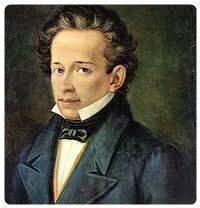 In the winter and spring of 1828, Leopardi was in Pisa. The longed-for separation from his native town, Recanati, had cost him years of negotiations with his parents. To extend his return home as much as possible, he had agreed to compile a collection of his works, with the proceeds of which he was able to maintain himself. 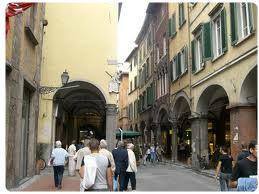 In the Tuscan city he rented a small apartment with a family, which usually housed students for little money. His room looked out onto a vegetable garden and was illuminated by two high windows, from which his gaze could go as far as the horizon. The poet went out into the city every day, walking along the Arno River crowded with carriages and people walking. On his return, the sister of the landlady, with whom Teresa Lucignani had made friends, waited for him on the balcony. In June 1828, Lo Zibaldone spoke of "a young woman between the ages of sixteen and eighteen", who had in her face, in her gestures, in her figure a "divine I don't know what". The beautiful Pisa reminded Leopardi of another girl, who had loved in her thoughts, who bore the same name, who died in Recanati at the height of her youth, Teresa Fattorini. Recalling the memory about thirty years later, the brother of the poet, Carlo had to speak of both as "distant affections and prisoners". Although he liked Pisa, Leopardi soon had an acute sense of nostalgia for his family and his world and this gave him a creative drive that he had not had for so long. Driven to remember and reflect on the past, Leopardi touched with lyrical enthusiasm the ideal stages of his life, the ardent desires, the hopes that had supported him, and then the disappointment before the collapse of illusions, the cruel revelation of the retreat and the subsequent state of cold apathy, finally the desire, equally recurrent for him, to die and end with the pain that tormented him. Animated by these feelings, he wrote one of his masterpieces, 19 April 1828. The composition was written in a flash, in just two days. 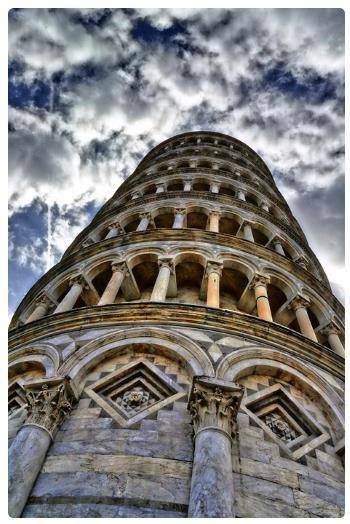 In Pisa, not everyone knows, there is another Leaning Tower, less famous and important than that of Piazza dei Miracoli, but that will perhaps arouse your curiosity. It is the bell tower of the Church of San Michele degli Scalzi from the 13th century; it is a structure with a cross plan, a gabled roof and a façade with three entrances. It is flanked to the south by a bell tower built of brick on a stone base, characterized precisely by its steep slope. The city has Ligurian origins; in the 4th century B.C. it was an Etruscan centre, then it became a Roman colony in 179 B.C. and then a Roman municipality. C. was an Etruscan centre, so it became a Roman colony in 179 B.C. and then a Roman municipality (89 B.C.). The Romans transformed Pisa into an important port and naval center. The advantages of the presence of the port continued in the Middle Ages, particularly with the first crusade. Later, like other Mediterranean port cities, the city experienced a significant decline, mainly because of the conflict with Genoa, which ended with the defeat of Pisa in the Battle of Meloria (1284). The city then passed under the dominion of the Viscounts of Milan (at the beginning of the fifteenth century) and then ended up under the power of Florence. From here on its destinies intertwine with those of the Tuscan capital. 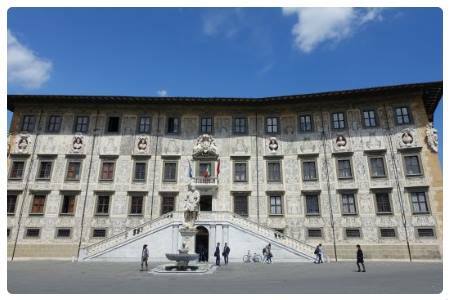 Despite the loss of political independence, Pisa has always maintained the character of a remarkable cultural center, both in the past, and now, with the University and the prestigious Scuola Normale Superiore. Pisa is the birthplace of some famous names in the Italian scientific tradition, including the great Galileo Galilei, the mathematician Leonardo Fibonacci (the famous "Fibonacci Number") and the physicist Antonio Pacinotti. Still today Pisa is a center of excellence in research thanks to the National Research Center CNR. Green places in the center of Pisa are the Botanical Garden of the University, dating from 1544 and then the oldest university botanical garden in the world and the Scotto Garden, where nature and history intertwine. The garden was created at the beginning of the nineteenth century by Giovanni Caluri for the family Scotto who had purchased in 1798 the fortress once belonged to Peter Leopold of Lorraine. 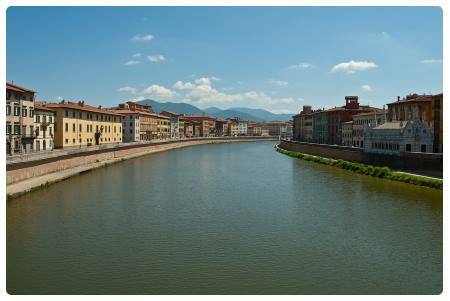 Pisa and its surroundings offer many and varied natural beauty, from Monti Pisani, up to the vineyards and olive groves of Volteranno, the Pisan Hills and the coast with beaches, systems of incredible dunes, large pine forests. A very green territory, where you can go trekking for hundreds of miles, riding and mountain biking by the sea or on the hills. 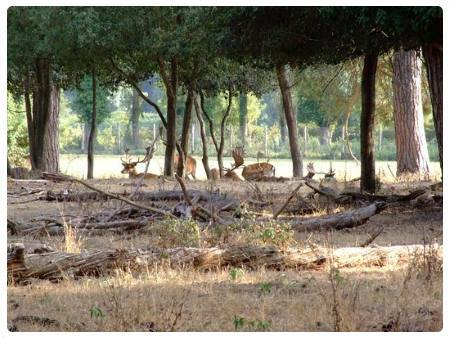 This is a small natural paradise with valuable vegetation and fauna that can be admired at the fantastic and still wild Natural Park of Migliarino San Rossore Massaciuccoli is a mosaic of natural environments extraordinarily intact. The park is open all year round with the possibility of guided tours by bike, on foot, in a carriage and on horseback. Pisa also has the sea, with beaches, pine forests and Mediterranean scrub. The proximity to the sea makes the climate even milder than the already excellent climate of Tuscany, and allows Pisa to remain a clean city, as the sea wind sweeps away the pollution of the city, especially in the winter months. The Pisan coast is presented with Marina di Pisa, Tirrenia, Calambrone and Marina di Vecchiano. Marina di Pisa offers beaches surrounded by cliffs, Art Nouveau buildings on the seafront and squares that open to the blue sea. From Tirrenia to Calambrone the beaches become larger, are accompanied by dunes and increase the size of the Mediterranean pine forests that surround them (planted from the eighteenth century). Marina di Vecchiano offers a long sandy coastline with a beautiful natural system of low dunes and lots of Mediterranean vegetation. In Tirrenia there are also two nine-hole 18-hole golf courses. All around Pisa there are villages and towns that wind along the Wine Road of the Pisan hills, where you can taste wine cellar, olive oil and you can sleep in the many farmhouses. 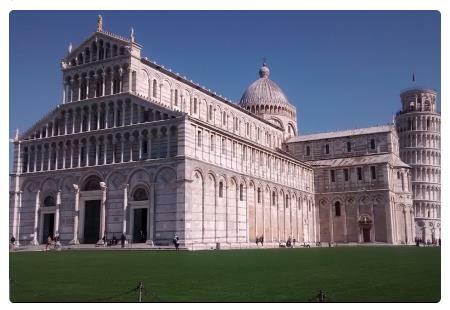 The economy of Pisa is based on trade in agricultural products, industrial activity (mechanical, textile, pharmaceutical) and tourist flows, attracted especially by the significant presence of monuments and works of art, the focus of which is the Piazza dei Miracoli. The Romanesque Leaning Tower of the fourteenth century, 56 meters high, with its 294 steps and its slope of about 4 meters from the vertical, is obviously the main attraction of the city, one of the most visited and most photographed monuments in the world. Going up there you really have the impression that you can turn from one moment to another. After more than ten years of closure, it was reopened to the public in the summer of 2002. Nei dintorni di Pisa sono presenti anche le terme di San Giuliano, nel palazzo del '700 dei Granduchi di Lorena in località San Giuliano Terme appunto, a pochi kilometri dal centro storico di Pisa, e ancora per gli amanti delle terme le acque di Casciana Terme, centro di cura e benessere da quasi 1000 anni. 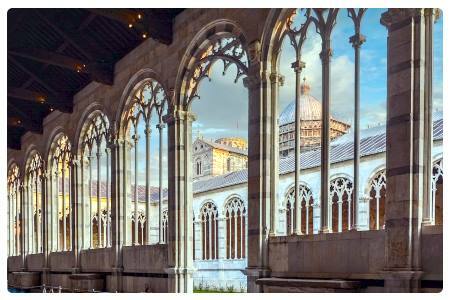 Inoltre la splendida Certosa di Calci, con il Museo di storia naturale e il borgo medievale fortificato di Vicopisano, ai piedi dei monti che separano Pisa da Lucca. Da visitare la città di Volterra (nella foto a lato), dove etruschi e romani hanno lasciato tracce significative, ancora visibili nel Museo etrusco e nel Teatro romano. Bellissime sono la pinacoteca di Volterra e il Museo dell'alabastro, dove sono esposti pezzi unici, tuttora d'ispirazione per i laboratori artigiani che da secoli continuano la tradizione della lavorazione artistica dell'alabastro. Rinomato il borgo medievale di San Miniato, dove a novembre si festeggia, con una tradizionale mostra mercato e con tanti stand gastronomici, il pregiato prodotto locale, il tartufo bianco. Interessante anche il Museo della fondazione Piaggio, Pontedera, intitolato a Giovanni Alberto Agnelli, che espone i numerosi modelli dell'azienda Piaggio ed è dotato di un vasto archivio storico. Ribadiamo infine che Pisa può essere un'ottima base per visitare altri luoghi o città in Toscana vicini come Firenze o Lucca a meno di 20 km o Pistoia a 40 km. In the surroundings of Pisa there are also the thermal baths of San Giuliano, in the 18th century palace of the Grand Dukes of Lorraine in San Giuliano Terme, a few kilometers from the historic center of Pisa, and for lovers of spas the waters of Casciana Terme, a spa and wellness center for almost 1000 years. Also the beautiful Certosa di Calci, with the Museum of Natural History and the medieval fortified village of Vicopisano, at the foot of the mountains that separate Pisa from Lucca. To visit the city of Volterra (in the photo on the side), where Etruscans and Romans have left significant traces, still visible in the Etruscan Museum and the Roman Theatre. Beautiful are the art gallery of Volterra and the Museum of alabaster, where unique pieces are exhibited, still inspired by the artisan workshops that for centuries continue the tradition of artistic work of alabaster. The medieval village of San Miniato is famous and in November it is celebrated with a traditional market exhibition and with many food stands, the precious local product, the white truffle. Also interesting is the Museum of the Piaggio Foundation, Pontedera, dedicated to Giovanni Alberto Agnelli, which exhibits the many models of the Piaggio company and has a vast historical archive. Finally, we reiterate that Pisa can be an excellent base for visiting other places or cities in Tuscany near as Florence or Lucca less than 20 km, Pistoia 40 km, or Livorno 27 km. If you liked this guide and want to help Informagiovani-italia.com help us to spread it.